Last week I left my highlands to travel to the flatlands. The very, very flat lands. So flat they are grand, in scale and scope. I went at the invitation of the tireless Anne Kennedy of the Great Artesian Basin Group and the Coonamble Action Group and I went to talk at the Coonamble Show about the book and the issue, which out here is CSG, the threat is Santos, and at risk is the Great Artesian Basin itself. This is bore-dependent country; there’s not been much joy from the rain lately. Anne and her group have done wonders in raising awareness here, as they have been doing for years re capping bores. Anne and her husband Neil kindly put me up at their ‘Yuma’ property and took me to the Show. That’s the house ‘oasis’ on the right, and Neil tells me that the wiry balls fretting at the fences are ‘roly-polies,’ not tumbleweed. Thinking of Triffids, I hope they can’t climb. The Show was a nostalgic treat for me — ah, the smell of Pluto Pups on the breeze! — the Coonamble Action Group are fantastic, and despite hiccups like the 100 Rich Land, Wasteland books ordered by Anne being lost — twice — one lot arrived minutes before my afternoon talk, and the day was a success. They sold 48 books! Coonamble is awake and on guard; the Landmark branch even displays and sells the Lock the Gate signs. What a difference one small persistent and passionate woman can make; and she now has really strong local support, informed, innovative and keen. Driving out next day, I passed other properties where the roly-polies were not kept in check, had jumped the fence, and were biding their time, playing ‘doggo’ amongst the emus. As I said, this is seriously flat land; the blue cotton bales floated in mirage water on the horizon. I was heading for Burren Junction, where Sonya Marshall is trying to wake up her region to the looming threat to their water. My route took me through Pilliga and on a long dirt road with foot-thick dust. 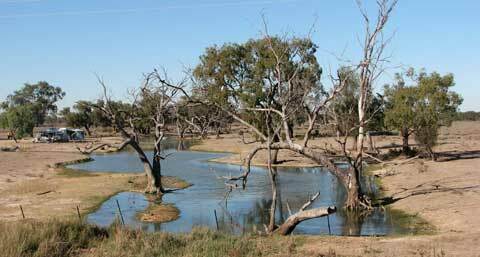 Sonya and Mick’s property, ‘Teranna’, is even more drought-affected than Coonamble, so even more dependent on their bores. They kindly hosted me that night and told me a bit about their area. I hope the talk at the Burren CWA Hall raised the alarm levels. The audience was small but involved, and the post-talk dinner at the pub was both enjoyable and enlightening. Next day, a different route to Pilliga took me through vast paddocks of impressive perspectives. Just outside Pilliga a mass of Winnebagos and minor mates were clustered around the Pilliga Bore Baths; the adjacent lagoon and wetlands were indeed warm, with carp swimming in them! I wonder if the tourists realise what will likely happen to these pressurised bores if Santos succeed in their CSG plans for the Pilliga? I did drive through the edge of the Pilliga and got a small sense of its magic. After calling in at the interesting NP Pilliga Discovery Centre in Barradine, I vowed to go back for a week at least to ‘taste’ the Pilliga in more detail.